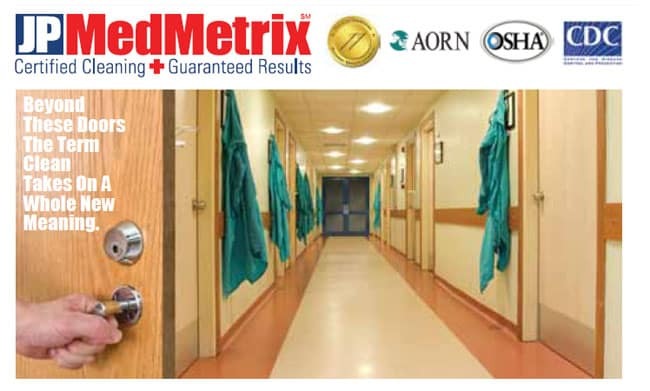 The core benefit of JP MedMetrix to all medical and related healthcare facilities is our organizational commitment to meeting, and in some cases exceeding the safe cleaning codes required by the industry regulatory bodies such as AORN, OSHA and CDC. JAN-PRO’s new program involves training, testing and certifying our franchisees specifically in the area of medical facility cleaning requirements. Franchisees who qualify and pass the JP MedMetrix program will be easily identifiable by their JP MedMetrix Certified Professional badge identification. Your local JAN-PRO representative will be pleased to share with you more detailed information on this important industry initiative. To learn more about how the MedMetrix can improve your medical facility, please call us at 719-264-1117 or use our Contact Us form.